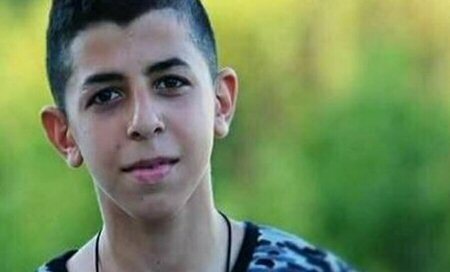 An Israeli military court has handed down a jail term of 18 months to a Palestinian minor as the number of Palestinian children being held, in Tel Aviv regime’s prisons and detention facilities, is soaring following US President Donald Trump’s decision to recognize Jerusalem as Israel’s capital and relocate the US embassy in Israel from Tel Aviv to the occupied city. The court passed the sentence on Qassem Abu Bakr, who is a local of the northern West Bank town of Ya’bad, on Tuesday, and also ordered him to pay a fine of 5,000 Israeli shekels (US$ 1,357.50). According to Press TV/Al Ray, the jail terms comes as nearly 350 Palestinian minors are currently being held under conditions in Israeli prisons, which do not meet the minimum requirements laid down by international rights institutions. According to the Palestinian Information Center, at least 8,000 Palestinian minors have been detained and prosecuted in Israeli military courts, since 2000. It is estimated that between 500 and 700 Palestinian minors, some as young as 12 years old, are taken and brought to trial in Israeli courts. The most common charge is stone-throwing. More than 7,000 Palestinian prisoners are currently held in some 17 Israeli jails, dozens of whom are serving multiple life sentences. Over 500 detainees are under the so-called administrative detention, which is a form of imprisonment without trial or charge that allows Israel to incarcerate Palestinians for up to six months, extendable an infinite number of times. Some prisoners have been held in administrative detention for up to 11 years without any charges brought against them. Palestinian detainees have continuously resorted to open-ended hunger strikes in an attempt to express their outrage at the detentions. The dramatic shift in Washington’s policy vis-à-vis Jerusalem al-Quds, on December 6 of last year, has triggered demonstrations in the occupied Palestinian territories, Iran, Turkey, Egypt, Jordan, Tunisia, Algeria, Iraq, Morocco and other countries worldwide. In an attempt to prevent the passing of the resolution, Trump threatened reprisals against countries that backed the measure, which had faced a US veto, earlier, at the UN Security Council. Israel, however, rejected the world body’s resolution while thanking Trump for his decision. On January 18, the United States reneged on a pledge to contribute millions of dollars to the United Nations Relief and Works Agency for Palestine Refugees in the Near East (UNRWA), which supports more than five million registered Palestinian refugees and their descendants. The announcement to cut aid to Palestinian refugees came after the US president made a threat to cut off aid to the UN’s Palestinian refugee agency.